The abuse of federal power literally grows by the day. Incidents of the heavy-hand of federal agents on private citizens litter the pages of local newspapers but very seldom hit the mainstream media. We see these stories because they come across our e-mail almost daily. A few of these events become emblazoned across the TV screen of those networks that choose to portray overt government power. One such event occurred at the Bundy ranch in Nevada where the Bureau of Land Management (BLM) employed over 200 heavily-armed SWAT team agents to accost the Bundies over alleged illegal grazing of the Bundy's cattle on federal land. Two more similar events are occurring in Texas and New Mexico. But most of these stories never see the light of day, like the story we are about to portray here. It is our hope that we can shine a bright light on what the Border Patrol is doing to a decorated, disabled veteran in a small town in Terrell County, Texas, about 16 miles north of the Mexican border. This courageous veteran and his wife own some acreage near the town of Dryden, TX and they have been fighting the Border Patrol over the issue of federal jurisdiction on his land for several years. In the process, the Border Patrol has labeled him an undesirable and a criminal and have been badgering, harassing and abusing he and his wife just because this veteran refuses to let Border Patrol agents on his property. Here are just a few of the incidents he has had to endure at the hands of the Border Patrol, in his own words. "On October 29, 2008 Border Patrol agents Shane Jahn and Fernando Sanchez told me, in no uncertain terms; that they could go anywhere they wanted and could do anything they wanted, to include breaking my fence. In front of me the two then pushed down, jumped up and down on my fence causing damage. Their tones and actions were abusive, threatening, and hostile. Both were armed. During this incident there were about 10 Border Patrol agents physically watching this act. For the record I was unarmed. I am also a 100% Disable Veteran." 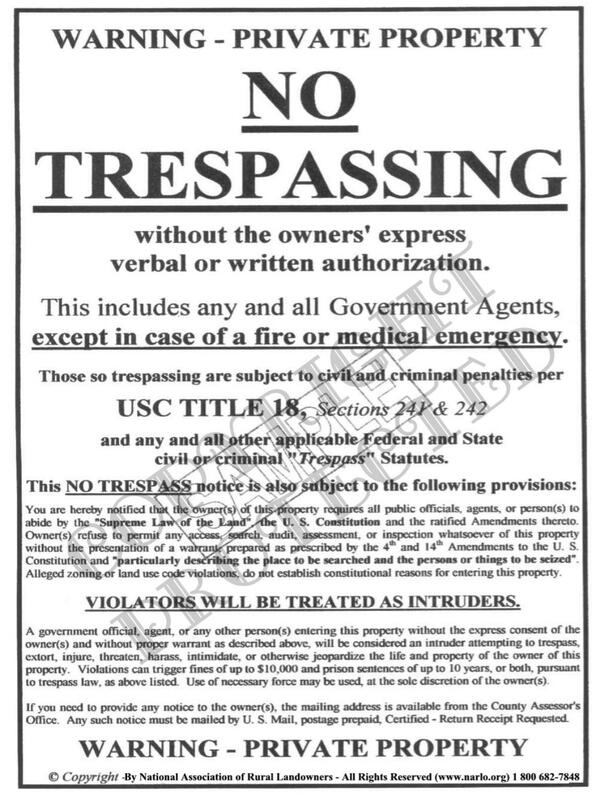 "On January 31, 2009, a group of Border Patrol agents appeared at my property gate. Their nametags were covered and when requested they refused to show ID or identify themselves. Border patrol agent Jahn was amongst them. The group wanted on the property to look for a back pack of drugs. The agents claimed a group of transients’ had crossed my property the night before. One agent’s response as to why this group would leave a backpack of drugs: a group of transients had been apprehended several miles west of my property a few weeks earlier carrying backpacks with drugs. I asked if the agents had searched the 16 miles prior to my property or any other property and they claimed they did not. The incident happened on a Saturday, two days before I was going to give the Grand Jury Foreman my criminal complaint. This was information I had already informed the County Judge, County Clerk and several other officials. It was common knowledge; I had made no secret of this fact." "My dogs held the Border Patrol agents at bay, refusing them access to our property. Shortly thereafter my wife and I observed two agents walking on the adjoining property to the north, heading east along the fence. One was the Border Patrol agent Jahn. These two individuals walked eastward along the fence line. A few minutes later those individuals came back past, riding on ATVs. The other agent had a large dark backpack on his back. There appeared to be a lot of effort to try and access my property to look for a backpack as if they already knew they would find something. That same day, one of the Border Patrol supervisors, Rush Carter, informed me that the Border Patrol considers my wife and I as the enemy. This statement has been documented in various certified letters to our elected officials as well as Mr. Moyer, AUSA, and has never been refuted, despite the multiple letters that were sent out referencing Rush Carter's statement. Rush Carter’s statement is now a matter of fact. This was the incident that border agent Rodriguez was claiming I had interfered with his subordinates that he alluded to Mr. Moyer, AUSA in his letter." "In the Fall 2008, as I was traveling home, one of the bridges was damaged due to recent storms, I was forced to back track RR 2400. A Border Patrol agent in a vehicle stopped me. The agent was taken back by the large dog in my car and even made a statement about my dog. I informed the agent he was not a peace officer, he had no jurisdiction and that I was going home. The vehicle followed me with his bright lights on. The agent would only turn the lights off when on-coming traffic came, but would turn it on again after the car passed. He tailgated me the whole way. I filed a complaint with the Sheriff who refused to do anything." "During the incident on February 3, 2013, I called 911 and told them I was on my way in to the Sheriff's office in Sanderson. I was followed by a large parade of Border Patrol vehicles. When I arrived, I called the 911 Operator and informed him I was outside. At this point, a Hispanic Border Patrol supervisor, whose name was hidden by the way he stood, came running up to my automobile. He proceeded to scream in a loud aggressive voice 'show me both hands.' I informed the individual that I was on a 911 call and interference with a 911 call was a felony. The Hispanic supervisor claimed he was not interfering with a 911 call as he again proceeded to scream in a loud and aggressive voice “show me both your hands”. The individual was obviously not in control of his emotions or he would have noticed that one hand was holding a phone to my ear, while the other was resting in plain view on my automobile window ledge." "The Hispanic senior supervisor continued screaming for several minutes to include such statements as “we can either end this the easy way or the hard way” as he demanded I get out of my automobile. I remained calm, reminding him he had no jurisdiction and we were not in a federal zone. I told him he might as well start shooting because I was not getting out of my automobile. Sheriff Deputy Howard then walked up to my window. He introduced himself and we shook hands. Deputy Howard remained calm and never lost composure, which cannot be said of any of the Border Patrol agents. The other agents were in array around my van holding M4s with the safeties off." "I kept reminding the Hispanic Border Patrol supervisor that he did not have jurisdiction. The Hispanic supervisor kept demanding I get out of my van, because he claimed he was going to arrest me and take me to a federal magistrate in Del Rio. His intent was to transport me across county lines without authority or jurisdiction. I, again, informed him I was not going to get out of my automobile. During this whole time, my six large dogs, which were traveling with me, were reacting, in my defense, to the actions and emotions of the agents." Numerous times I demanded to know from the Hispanic Border Patrol supervisor if he was the Officer of the Day or the Officer in Charge for the Shift. His answer 'They (Border Patrol) are all officers of the day and all in charge.' Basically he gave a 'none answer'. The Hispanic Border Patrol supervisor claimed that since Deputy Howard and I had to introduce our selves, that I obviously wasn’t from the county. He implied that I was lying about being from Terrell County to which Deputy Howard stated that, although, we had never met, he knew of me. Pat weights about 110 pounds and has no use of his right arm. He limps because he has a lot of muscle mass missing in his left leg. Stress affects his disease. And what he has been going through is very stressful. His pain levels have been through the roof lately. He takes no drugs or medications. There is no treatment and no cure for what he has. The VA would give him morphine, but Pat refuses. "If you can't think, then why be alive" is Pat's motto. He has never even smoked cigarettes and rarely has an alcoholic drink. These incidents with the Border Patrol bring back a lot of memories. Pat was involved in 17 combat zones, in places were Americans allegedly weren't. He was the last man standing from a team that went through the area that Saddam had sprayed with toxic agents, killing thousands of Kurds. Nothing lives there, no birds or insects. The Kurd guides died within six months because there were holes in their chemical suits. Pat had other medical problems before being sent on this mission. He chose to go to San Antonio to the VA hospital there, after returning from Iraq. The rest of the team went to Bethesda. Those that went to Bethesda were all dead within about two years. The Border Patrol doesn't just give Pat a hard time. During the years they have lived there, they have heard lots of property owners complain. Everything from Border Patrol agents cutting fences, cutting locks and putting their own locks on the gates, leaving gates open letting livestock loose and poaching on private property, even outside hunting season. They take their ATV's and tear up the vegetation on the private property. The biggest thing they hear is that local Border Patrol agents are involved in drugs, not using, but supplying. One man that used to own property down 5-mile road said he would watch the mules drop off multiple backpacks and then leave. About an hour later a Border Patrol agent would show up and collect the backpacks, then drive off on their ATV's. Look, we know that the Border Patrol has a tough if not impossible job. But that job should not include corruption, drug running, or harassing and threatening private landowners and claiming jurisdiction where there is none. To Pat, it is all about jurisdiction and he has vigorously researched the law about this thorny issue. We have uploaded "A Brief on Federal Jurisdiction" to our website. Pat has called the Border Patrol on the jurisdiction issue in letter after letter but their answers are couched in vague federal law. We have also uploaded to our website the "Certified Letter Pat sent to the U. S. Attorney in Del Rio, Texas." For those interested in the law of federal vs. state jurisdiction, it is an informative read and loaded with court case precedents. Much of what we have written in this article came from Pat's letter to the U. S. Attorney, along with some notes from Pat's wife. We applaud Pat's extraordinary courage under fire from arrogant government agents and this brave veteran needs your help ….. TODAY! For any of you who would like to write in Pat's defense, names and addresses of the appropriate authorities appear at the end of Pat's letter. We encourage you to put your strong feelings in a letter on his behalf, to each of the addressees shown. We will be sending a copy of this article to those addresses. Pat is one of America's heroes and he has paid and is paying a terrible price for his service and sacrifice. He deserves better. Pat's story is just one of tens of thousands (if not millions) of lawful American citizens and rural landowners who are under a vicious attack by local, state and now heavily militarized federal authorities. If it isn't the Border Patrol, it is DHS, the EPA, the BLM and the Army Corps of Engineers at the federal level and a horde of local and state land use agencies, driven by national security agendas, social justice issues, or radical environmental policies. For those of you who find themselves in the "gun sights" of some government agency like Pat and his wife, including the IRS, and would like to fight back, there is a treasure of valuable information on our two websites, HERE and HERE.